Mark your calendars for July 16th!! 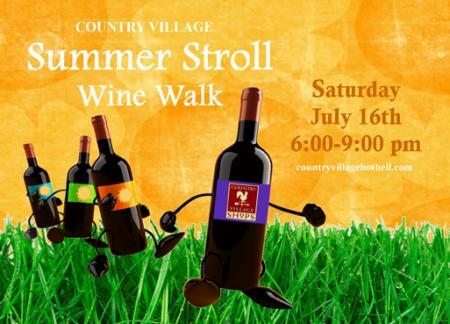 The Country Village in Bothell Wa is hosting a “Wine Walk” that is open to the public. What is a Wine Walk you ask? It is when a group of local wineries get together and set up a bunch of booths with their wine selections throughout a designated area. The public is able to purchase tickets which allows them to walk from winery to winery sampling their goods! It is a great way to spend an evening with friends. There will be complimentary limo rides through the village, gourmet cupcakes live music and more! After the wine walk, look to Country Village to provide some of the best food around through their local restaurants. Carolina Smoke’s Prime Rib, Vivendo’s incredible Italian Food, killer grub at Papa’s Place.. there are many places to have dinner before or after the walk. Most restaurants have a small corking fee so that you can bring your new delicious wine discoveries with you and enjoy them with your dinner. A great time for sure, see the information below about tickets and prices. Village Perks:Complimentary limo rides through the village will be available between 5:00-7:00. Pick up your free ‘rider pass’ at check in the night of the event. Free limo rides compliments of Bogan Limousine Excursions. Complimentary chocolate stuffed cupcakes with Washington strawberries and topped with a Port butter cream frosting, courtesy of Foundation House in Bothell. Live music, performed throughout the village, by Charlie Spring 6:00-9:00. Proceeds from this event benefit the Northshore Performing Arts Center Foundation. Must be at least 21 years old. Photo ID required. This is a BYOG event (bring your own glass). Additional tasting tickets are available for purchase through the check-in-booth.